Battery backup devices have been around for decades now, but relatively few computer owners use them. And based upon my experience, that is a mistake. What are battery backups and why do I need one? When an issue with the power line occurs, the power source to the computer is switched virtually instantaneously from line power (electrical outlet) to the unit’s internal battery. This prevents the computer from losing power. 1 – A sudden power loss can corrupt your Windows installation, resulting in the computer refusing to boot up again without a visit to the repair shop. 2 – Brownouts and power losses can weaken the internal components of your computer or damage them outright, again resulting in a trip to the repair shop. 3 – If your computer shuts down unexpectedly while you’re using it you’ll lose any unsaved work, which can be a huge loss if you’ve been working on an important project for an hour or two. Power surges and lightning strikes can damage or completely destroy your expensive computer equipment, and while a standard surge can protector help somewhat, the surge suppression built in to most battery backup units is far more effective at reducing or eliminating those dangerous surges. What’s more, the better (i.e. more expensive) battery backup units also contain line conditioning circuitry which ensures a steady supply of “clean” voltage at a rock solid 60 HZ. Battery backups are rated in both wattage and estimated run time for different types of PCs (laptop or desktop) . Note: They also have a “VA” rating, but I recommend choosing your battery backup device based on the wattage rating since because your computers and gadgets are rated in Watts. In general, the higher the wattage it can supply to the computer and the longer it will keep it powered up the better, therefore the wattage is the most important attribute to consider. Personally, I won’t purchase a battery backup that supplies less than 300 Watts because personal experience has shown that anything less is inadequate for powering today’s PCs and monitors. The one that powers my “work” desktop system is rated at 900 watts. Depending on your particular situation, you might even consider using multiple battery backup systems. For example, I use the aforementioned 900 Watt unit to power my “work” desktop PC and monitor and a separate 350 Watt unit to power my cable modem, router and wireless landline telephone. That way when the power goes out I have at least a couple of hours during which my Internet connection and landline phone will continue to work. With any luck the power will come back on before that which means there will be no service outage. How much does a quality battery backup unit cost? 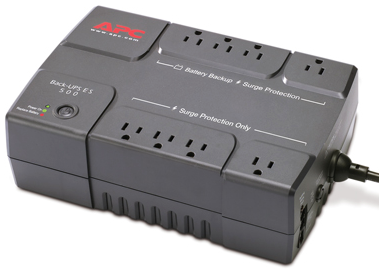 The most popular consumer grade battery backup systems are made by APC and CyberPower. Prices start at around $40 or so, but I recommend that you opt for at least a 450 Watt unit even though it typically cost a few dollars more. Of course models with line conditioning built in cost more still, but I believe the extra investment is definitely worth it. In my opinion it makes sense to spend just a few dollars more than you would pay for a quality surge suppressor in order to protect your expensive computer equipment from damaging power surges, brownouts and power interruptions with a quality battery backup device. After all, a few extra dollars spent now will save a lot more of them later on, not to mention the aggravation you’ll feel if you lose the fruits of your hard labor. Amazon offers a full line of UPS/ battery backup units at great prices, and most of them come with free shipping! Click here to check them out! Bonus tip #1: Read this post for a real-life example of how a quality battery backup device can be a financial lifesaver!